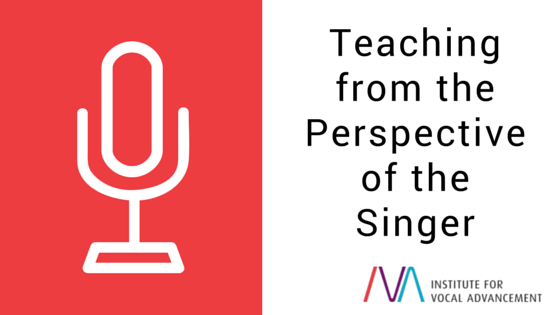 In IVA, we teach singing from the perspective of the singer. What this means is that we use terminology, concepts and practices that allow a student of singing to find and maintain vocal balance in a manner that is highly accessible to the them. We avoid methods of teaching that involve a lot of scientific or descriptive terminology that can be potentially confusing to our students. 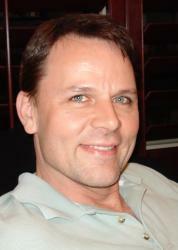 For instance, if I am teaching a student who is singing with a lot of tension in the muscles outside of their larynx, I would give them a simple cause and effect exercise that immediately creates for them the experience of a vocalized tone that is released and free from the tension they were using. Once they have an experience of the desired result, they can get used to this new feeling of singing without all that excess muscular effort, and we can move on to the next phase of their training rather quickly. Imagine if, instead of giving them an exercise, I told them, “you need to temporarily engage your infrahyoid muscles so that you can attenuate muscular activity in the suprahyoid regions. You may find that there is some temporary loss of arytenoid activity during phonation, however this will be addressed at a later time.” I doubt I would get the desired results in that lesson. Have you ever heard of a piano lesson consisting of a discussion of string gauges, acoustical law and piano tuning? No, in piano lessons a teacher always teaches from the perspective of the pianist. Do guitar teachers require that their students understand luthier craft, and learn to calculate fret placement before they can play? No, a guitar teacher always structures the lesson from the perspective of the guitarist. Singing is the only musical art form I am aware of where a great many teachers are under the impression that their students need to understand scientific concepts in order to participate in their art. When teaching from the perspective of the singer, a student is able to focus all their time and energy on learning to sing. Conversely, singers who learn from the perspective of science often sing with excessive tensions caused by attempting to exert direct control over the muscles in the laryngeal area, or trying to control formants and vowel tunings in the vocal tract. Granted, just as a ballet teacher who knows about dance kinesiology and anatomy may be a better teacher because of it, a teacher of singing who has education in vocal science often gets a clearer understanding of the vocal instrument, and this is a very good thing. Yet discussions of vocal science really have limited value in a voice lesson itself. We find it best to stick to teaching singing while in a singing lesson!